Handicap ramps provide accessibility and mobility to disabled persons and persons in wheelchairs. When planning and designing a handicap ramp, it is important to consider the safety and needs of those who will be using the ramp. The Americans with Disabilities Guidelines provides detailed information about the safety requirements for handicap ramps. 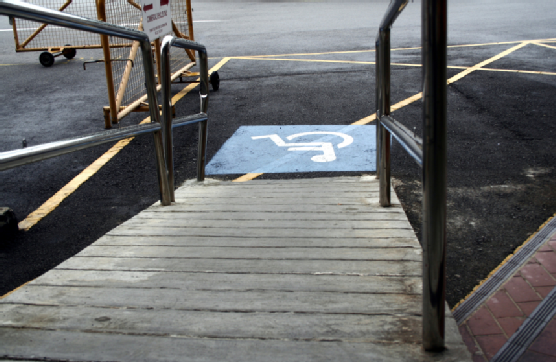 If you are planning on installing a handicap ramp for your building, here are some of the important safety requirements that you should keep in mind. Slope ratio is a term that is used to describe the degree of grade or tilt on a sloped surface. To ensure the safety of all users, the Americans with Disabilities Guidelines recommend that all handicap ramps have a slope ratio between 1:16 and 1:20. These slope ratios will provide a safe ramp that is easy for all users to navigate. When constructing a handicap ramp, there are several safety elements that must be included. The ramp must be at least 36 inches in width, and should be equipped with protective surfaces around the edges. These ramp dimensions are designed to ensure that users do not slip when they are using the ramp. Along with incorporating specified ramp dimensions, all handicap ramps should be constructed out of approved materials. Wood, aluminum, steel, and concrete are all materials that are commonly used for handicap ramps. When constructing a handicap ramp, it is essential to treat the ramp surface with a textured component that will prevent slipping. At Williams Lift Company, our expert technicians can design and install a top quality handicap ramp that is suited to your needs. Along with our handicap ramp services, we also offer a great selection of stair lifts and wheelchair lifts. Call our NJ location at (908) 322-7070 or visit us on the Web to learn more about our highly rated accessibility services.